Sorry about the lousy-overexposed-headless photo, but we work with what we've got around here. 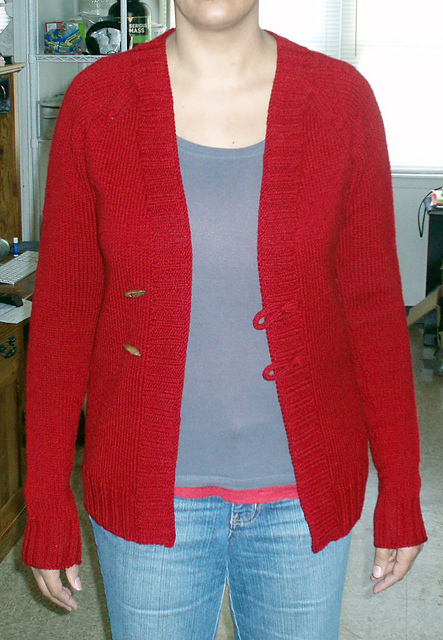 As you can see, I finished the sample for the Apogee cardigan and I'm quite proud of it. I had no idea it would take on a complete life of it's own but it totally did, lol. 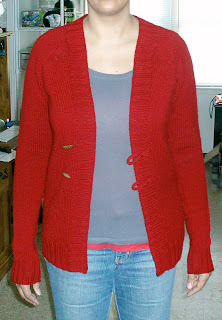 My finished sweater fits better than the pullover did (thanks to the corrected pattern grading numbers) and used one skein fewer, even with the wide bands and toggle closure. And speaking of toggles...I thought they looked funny in the picture, and realized that I'd put the toggles on the men's side instead of the women's side. But I think I'm going to leave them right where they are because the sweater looks like a 'boyfriend' sweater and this just adds to that feel. Both patterns are back with the technical editor and I've got a photo shoot scheduled for next week. I'm going to call around for a few quotes on printing a small run of patterns. 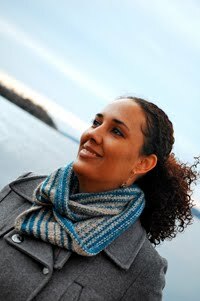 I've offered to donate copies of the cardigan pattern to the Great Rhody Yarn Crawl this year (April 15-17) and I'll need some hard copies for them to hand out to the participating LYS's. 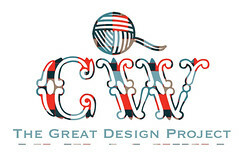 My graphic designer is working on an official cover page for my pattern layout and I'm hoping it will be ready by then, but as I'm doing a tiny run just for this event, it's not critical if I don't have it. Hopefully I'll be able to release both designs by next month! pattern writing and design is hard, lol. But you already knew that right? It's easy to get super detailed in a one-off garment but much more complicated when you have to write out instructions for that garment. Sometimes a small detail can take paragraphs to write out, and may need a different set of directions for each size. That gets wordy, and complicated, and costs a lot to print. Not always worth it. it's better to start with your sketch, decide exactly what sizes you want to include, work out most of the necessary numbers based on the gauge of your design, and then write out as much of the pattern as you can before you start knitting the prototype. I used to believe that I couldn't possibly write the pattern before I started knitting, but think of it like this: if you've knit a dozen pairs of socks, you know how they're done and really don't need a pattern for most of it. You can just grab needles and yarn and start knitting. I've knit enough sweaters in the last three years to know what most of the parts are, and what order to knit them in...so I can write most of that out and make necessary adjustments as I knit the sample. my math teacher was right...it is important to show your work. I've learned to write out every single step and label them for future reference. It saves me a lot of time if I need to go back and adjust something later. I don't have to work the entire formula over in every size...I can start at any step in the process and work forward from there. patterns need to be edited before testing. (see earlier posts for a refresher if necessary). it's a good idea to have the pattern tested, if for no other reason but to see if there is a section that causes confusion to the testers and to see how well it actually fits. This is helpful in making sure the smallest and largest sizes fit correctly, as I'm not used to designing for a size range this wide. I've got to say that this has been an extremely educational experience for me personally, even if no one else ever reads this series, lol. Designing this sweater online forced me to stick with it. I'm proud of myself for pushing through and figuring it out :) And I'm not done my friends! I'm working on a small handful of secret projects right now but I will definitely be doing more designs out in the open so keep your eyes out. Very interesting post. I sometimes write down pattern and yes, it's so much work! lol I didn't notice the men's side of the toggles. I love the color and the cardigan is very nice. Bravo!